We know that being able to move around in the app is important so we've changed things to incorporate a new side menu. 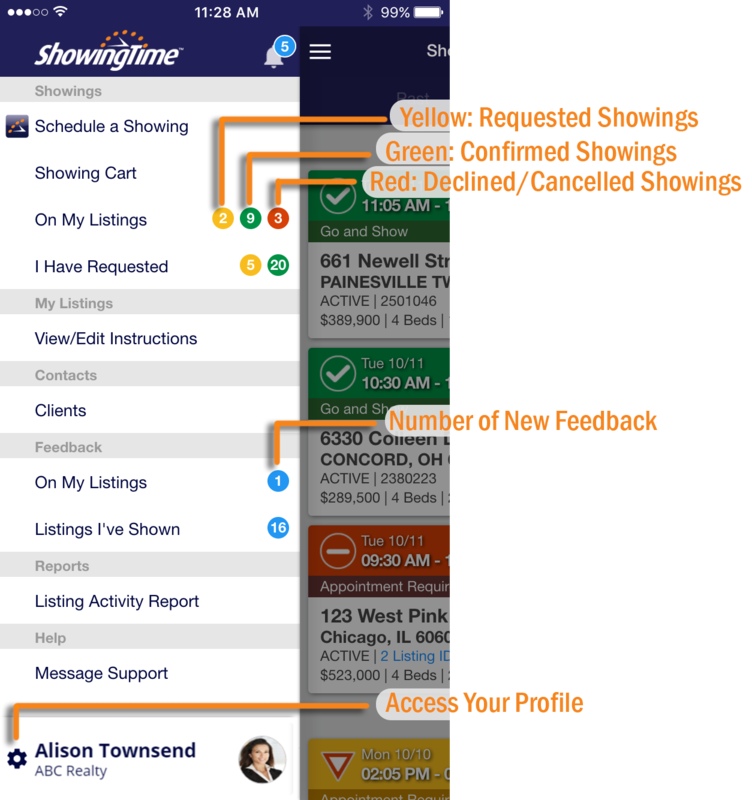 It still contains the links to schedule showings, check your feedback, manage your listings, and view your listing activity report. Accessing your profile and adjusting your settings is handled at the bottom of the menu. The new scheduling screen layout is built to save you time. 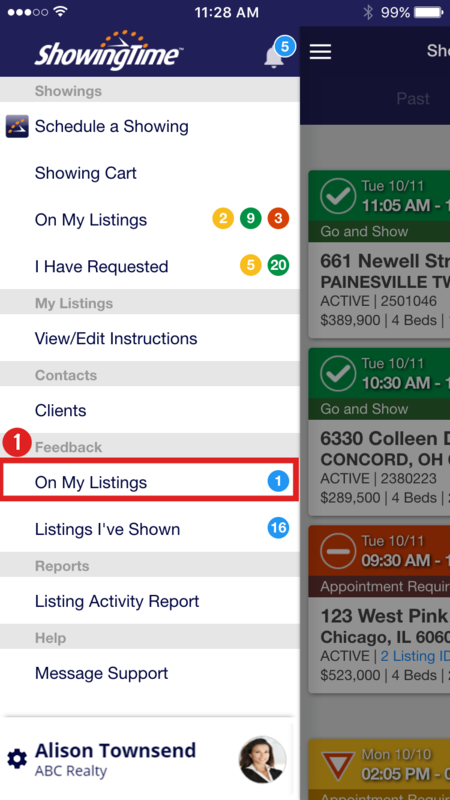 You can see the times you already have other appointments, showing instructions, access details, and even send a note to the listing agent. 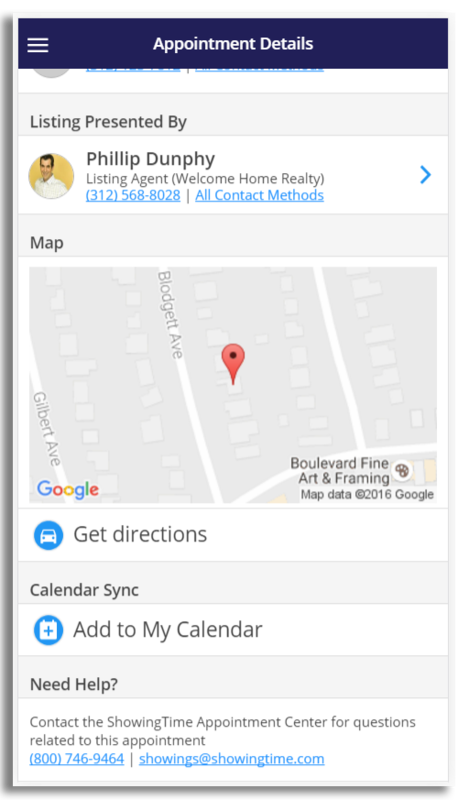 Search for a listing, choose a recent one, or schedule on your listing. You can select an existing buyer, add a new buyer, or choose not to attach a buyer to this appointment. Adjust your contact preferences, add a note, or select the appointment time. You can use the calendar to schedule for any date. If you have existing appointments, they will be visible on this screen. You can also adjust the length of the appointment. Submit your request by clicking the Request Appointment button. You will be notified that the request has been sent before seeing the appointment details screen. 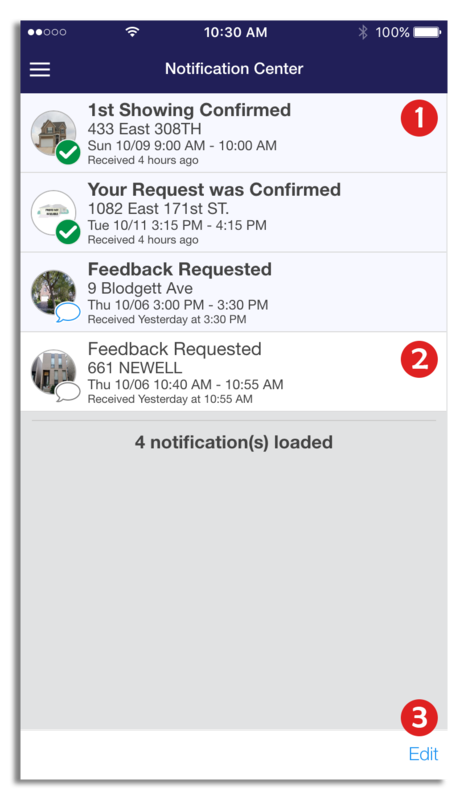 The Appointment Detail screen will show you Appointment Actions such as reschedule or cancel and Access information. The listing agent's contact information is also available. Our staff is also available should you have any questions. #1: The light blue background indicates a new notification. #2: The white background color indicates a notification that has been read. #3: The edit button will always be at the bottom of the notification center should you need to delete one or more notifications. Different types of notifications can be present in this list. Each will have a different status icon and wording. A count of the notifications loaded can be seen at the bottom of the list. By scrolling down, you can load more (if they exist). Notifications that are read will not be counted on the application's badge. In order to keep all notifications but update the notification count. You can select one or more notifications with the check-boxes on the left and then choose the Mark Read button on the left side of the menu. In order to remove individual notifications select the notifications that are not needed anymore choose the Delete button in the middle of the menu. Remember, you are deleting notifications only. It will not affect actual appointments and feedback. You can always cancel your selection(s) and leave the "Edit" screen. Note: These updates may not be available in your market yet. Feedback or remarks about a listing are invaluable tools that a listing agent can provide to the owner. Not only can they be used to subtly hint at the things that people don't like, but can also influence small changes that mean the difference between one more week on the market and a signed contract. 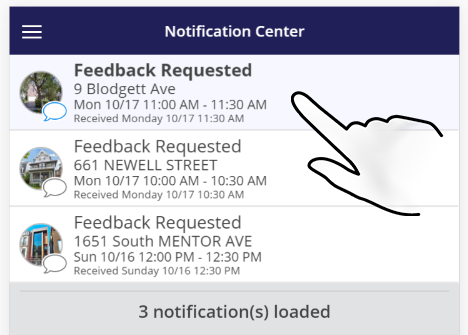 Accessible from the slide-out menu, the new feedback screen shows you the difference between those that are new (in blue) and those that you are still waiting for a response on. You can search for a particular address or by listing id to narrow down the list. In the title bar of these feedback cards, a user will be able to see the text which shows the up-to-date status. Waiting for Response – The showing agent has not yet filled out the questionnaire. 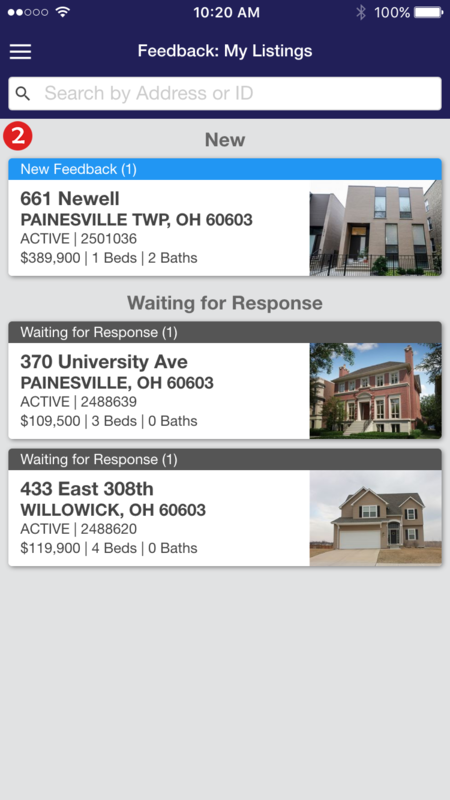 Viewed – The showing agent has submitted it and you (the listing agent) has viewed it. What remains is to publish it for your homeowner. Please Note: It is possible to have both of these titles in the top bar if the listing has had multiple appointments on it. Each card will also show you the status of the property, the price, the number of bed and bathrooms and the buyer's name if you added it. This feature may not be available in your market. From the home screen, open the side menu and tap On My Listings, underneath the Feedback section. A blue card indicates that feedback has been submitted. 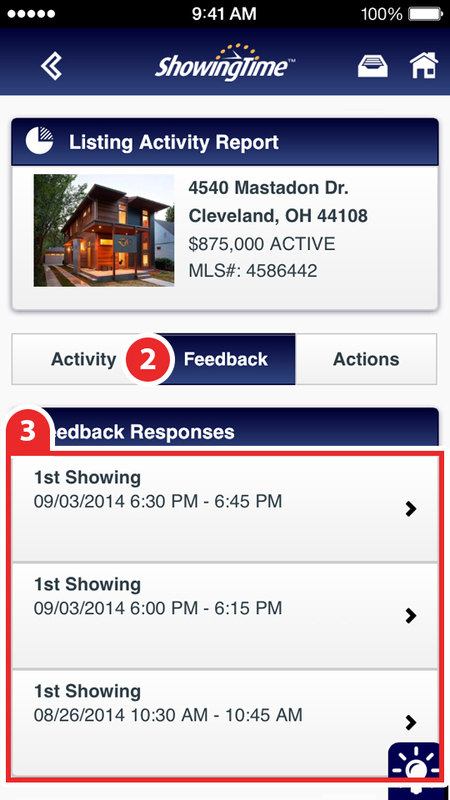 A gray card will indicate that you are waiting for a response from the showing agent. Feedback can easily be managed and sent to the owner from this section. 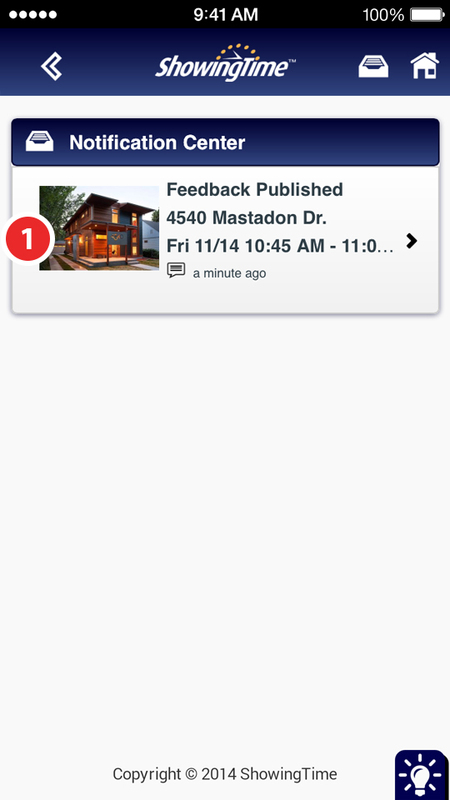 Under Feedback Actions, an agent can publish the feedback to homeowners. 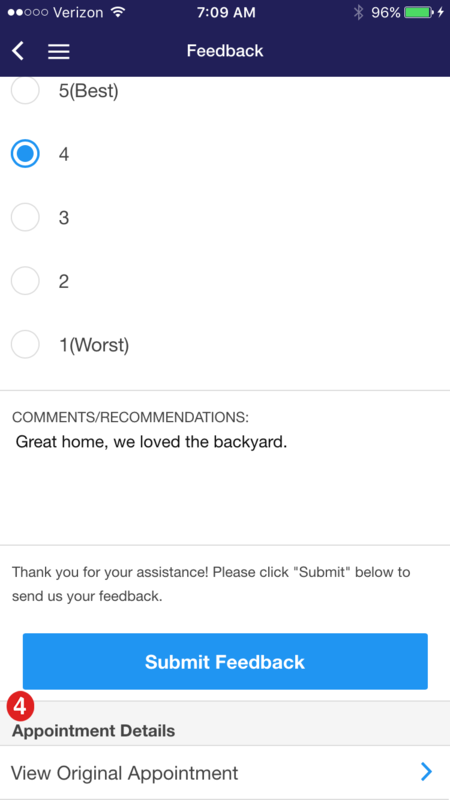 A copy of the feedback can also be forwarded to any homeowner associated with the listing or any other contact. Immediately above the responses to the questions you asked, the status of the feedback will be shown. Additional information, such as the original appointment details and history can be seen near the bottom of the page. If a push notification has been received, tap on the notification from the Notification Center. If an email has been received, then tap on the Click to Give Feedback button. Please Note: This feature may not be available in your market.